There must be a reason why this movie remains to be Singapore’s all time highest grossing movie. With over $5.8 million box office takings, the movie must have struck a chord with viewers, considering no other local production has surpassed the title in the past 10 years. And as we watched the Jack Neo written, Tay Teck Lock directed movie, the only thought that crossed our minds was: what timeliness. If you remember, the movie was released in cinemas in May 1998, in the face of the Asian financial crisis. With the looming deterioration of the global financial markets and its impact on Singapore’s economy, the relevance of watching this movie now seems greater. And it doesn’t matter if the hairstyles and fashion looks dated, because the problems of not having money in our fast moving society are timelessly portrayed in the picture. The 96 minute movie tells the story of three Singaporean men who come from different backgrounds but face the same dilemma of “money no enough” in the harshly demanding Singapore. The scenarios painted in the movie are realistically poignant: lack of academic qualifications, computer illiteracy, installments, obsession with mobile phones, rising costs of medical fees, the true meaning of filial piety and a whole long list of other “uniquely Singaporean” subject matters which a true blue Singaporean will can feel connected to. That is probably the reason why this movie managed to resonate with local viewers, spurring it to achieve an unsurpassed box office glory. The use of familiar terms in Mandarin, English and Hokkien is probably another reason why this movie is a crowd favourite. Sure, the language used may be coarse (see that consumer advice on the DVD cover), but Singaporeans love it when they see a realistically portrayed character spouting Hokkien vulgarities. Jokes that take jabs at the government are Neo’s trademark, and that never fails to make the heartlander viewers happy. Together with his trusted companions Mark Lee (Ah Long Pte Ltd, Just Follow Law) and Henry Thia (Money No Enough 2, I Do I Do), the three men give earnest and true performances which make you feel like you are witnessing a familiarly average Singaporean going through financial woes. While there isn’t much fancy camera work or showy production values to boast of, this movie stays grounded to work as a successful satire of the local culture, and earning a rightfully respected place in the history of Singapore’s growing film industry. 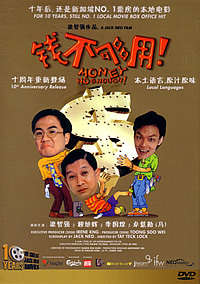 This Code 3 DVD contains a 34 minute The Making-Of shot during the 10th year commemorative screening of Money No Enough was held in April 2008 at GV VivoCity. Neo and other cast members talk about what the film has done for their careers, and we see get to pin a face to the director. Shame on you, those thought that it was Neo who directed the movie. Included on the disc is also a Trailer for the movie. The disc’s visual transfer maintains the grainy and dated look of the film (there is one section which looks dubiously re-mastered digitally with re-recorded audio though) and the audio track is presented in its original Mandarin, English and Hokkien dialogue.